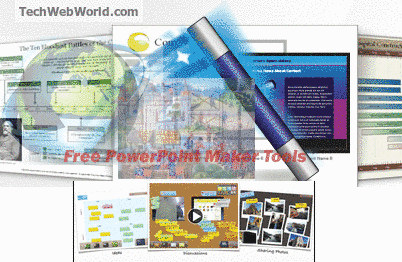 Online powerpoint maker tools let you make presentation online for free without installing any software i.e Microsoft Powerpoint. You know usually and most commonly the Microsoft powerpoint is used to make presentation, slide-shows of your images but here what if you don't want to install this heavy application on your computer machine. Or suppose you don't have enough knowledge of using Microsoft Powerpoint. Other reason that lead you to make use of online PPT maker tools is that you don't need it on regular basis but only for one-time use. So in these cases these online tools become very handy and saves our time. these tools works as alternatives to powerpoint e.g you can use them for the purpose for which the microsoft powerpoint is used. Well, if you are in the search of these tools then I would like to inform you that you are arrived just in the right place because here we are going to share the list of best and free powerpoint alternatives. We collected the best of tools after measuring bundle of tools available, from different angles and then given it a shape of list to bring it to you through this post. An awesome with greatness, online alternative to PowerPoint. Let you create presentations for free online.To use this one, you will need an account just like the above one, but it makes the account creation process very easy i.e you can log-in through Facebook, Google account. After logging-in, you will be redirected to your dashboard from where you have to select 'Create' and then select template to edit. Now you will be redirected to simple, flash-based and user-friendly interface where you have to work on it.Options like Preview, Adding text, images, import videos (from youtube) or available there. Select one by one slide from the left side to work on it. Visit PowToon's website to get started. Prezi, If fount it very useful as i used it for creating a presentation for my own. Pre-made templates on prezi are just awesome and good-looking. It is free to use but if you use it for free, the presentation, slide-shows you created will be public.A simple interface make if easy-to-use and easy to understand. Options like inserting images/videos, Applying amazing Pre-made themes, Adding frames and themes make a presentation software perfect! Visit Prezi to see the scenario on your own eyes!!! Above we discussed some online alternatives to PPT, now here let give you desktop application. KingSoft is an alternative to the PowerPoint which can be installed and used for free on your computer. First of all, download the application from THIS link and install. Run the 'KingSoft Presentation' program At the left side you will see some download links of different categories of templates. So click on one of the type you're interested in. You will be redirected to a web-page where lots of templates will be there to download for free and use. So download and edit in Kingsoft presentation. So Friends, in this post we shared some PowerPoint Presentation maker tools that we though are the best. I hope the list provided above was helpful for you.If it was, then please spread our voice by sharing this post on social networks occupied by you. Also read our previous post that was List of secure cloud storage.